Us organised activities such as walking city tours, visit around other towns or around the city, like for example Tarabuco , Yotala, Potolo ,and others places. 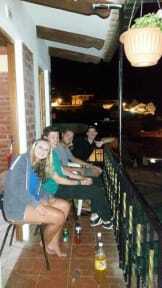 Some days of the week we organize nights walking tours and lessons salsa in near bar of the hostel. Casa Residencial Maya Inn B&B is located in the Historic center part of town 5 blocks from the central square, near to the amazing place La Recoleta Pointview and Indigenous Art Museum. - Towels and paper toilette is included for All Rooms. The hostel was really nice and I would definitely come back again! Tolles Hostel, nah am Recoleta Viewing Point auf einem Berg gelegen. Fußweg zum Hauptplatz ca 15 Minuten bergab. Große, geräumige Zimmer mit bequemen Betten. Frühstück jeden Tag anders, aber immer ausreichend. Super Wifi und nettes Personal! Bathroom wasn't so nice. Breakfast only one Option per Person. But Personal was friendly and helpful. Privat room was nice. Easy way to the City.